Good match. It was pretty simple, but the pace was kept high. TAKA managed to capitalize on a lot of his fake-out strikes, but Ricochet seemed to build momentum throughout the entirety of the match. Good match. Liger started out strong and went move for move with Dragon Lee. Both men hit some nice dives and worked together to create some great sequences. The match remained very even up until the very end. 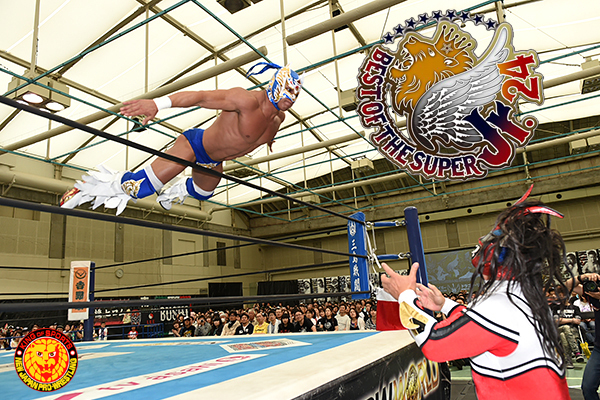 Liger is too far behind to catch up at this point in the tournament, but he’s easily the sentimental favorite. That added a lot to this match. Everyone seems to be hoping that he gets at least one win. Good match. It was basically three on one with Taichi, El Desperado, and Kanemaru all working in unison to attack and distract Ospreay. Weapons were used heavily, and it didn’t help that the referee pretty much allowed anything and everything to go. The overwhelming adversity did help to add some excitement to the match since Ospreay is a heavy favorite in the tournament and always seems to find a way to fight back. Good match. Scurll seemed to be in control of most of this match, if only slightly. The last portions of the match contained a lot of kicks and felt rather one-sided. I liked the finish, but it did feel a little underwhelming after the buildup in the match. Another good show. I think overall the matches were better tonight than in night 9. Block A seemed to even out a bit tonight with five men tied for the top spot. It’ll be interesting to see how the last two matches go for everyone. This was the most fun match of the night for me, and the most continuously entertaining throughout its duration. The added sentimental pull for Liger probably helps a lot as well.